If you are a reluctant credit card user with a reasonably thick credit file, banks want you. Badly! It’s like that joke, remember? How banks love giving loans to people who don’t need them. Same thing. Banks hope you will become loyal and spend lots of dough on their credit card so they can make money on the interchange fees. Their bigger bet, however, is that you will get careless and carry your balance indefinitely at 13-18% interest rate. Which is why they try to outbid each other on Welcome Bonuses and other perks to snag your business for all your purchasing needs. The thing is, you’re not that kind of client. Because if you are — just keep paying cash and keep your credit card strictly for emergency. If you must carry a balance, forget about miles, points, and cashback. Forget bells and whistles. Just find a simple credit card with a SINGLE-DIGIT INTEREST RATE. But if you’re financially disciplined; if you can pay off your balance every month and avoid all those silly fees; and if you haven’t applied for a credit card in the last 2 years, you’re ready for this miles and points strategy. Keep reading. After a few months of neglect (sorry), I’ve finally updated my two lists of the best travel credit cards in America. And there are quite a few options for all of us. 0/24, 4/24, 25/24 – it doesn’t matter. There is something for everyone. Those of you who have no idea what I’m talking about, please click on one of the links above, scroll down and read Credit Card Rules. This post is geared toward the beginners. I love playing around with complex or relatively complex topics related to our hobby, but not everyone is ready and willing to dig into the intricacies of maximizing free stopovers on Cathay Pacific. So let’s get to the basics for a change. Like how exactly you start traveling for [very close to] free. You start by applying for new credit cards. Contrary to what the common wisdom might say, it’s easy and safe — as long as you exercise common sense and don’t get in over your head. But first… I apologize for quoting myself, but I simply have to. If those crazy credit card sign-up bonuses are here to stay, why not get into the game right now? What are you waiting for, exactly? On the other hand, if those crazy bonuses are going to cease to exist, again – why not get into the game right now, while you still can? The third possibility is that credit card companies will gradually crank down the volume and bring bonuses back to pre-2008 level… I personally find this possibility more believable than the doomsday scenario of option #2, but it prompts the same question: why not get into the game right now, while you still can reap the most benefits out of it? Today, in 2018, this axiom still holds true. Come on, veterans, I know you like to keep good stuff to yourselves, but can you honestly say it ain’t so? To anyone who is new to the hobby – there are 2 main principles of your miles and points strategy. You know how conventional wisdomers always tell you to choose the airline or hotel chain you like and stick to it? Make an educated choice to ignore that advice. A leisure traveler has no chance to earn hundred of thousands of miles or points or achieve the elite status organically, and if you try to achieve it any other way, you’re wasting your time and money. My suggestion is, you want to start with collecting miles for United Airlines. Why? Because United is partnered with Chase, and you must start with Chase if you want to optimize your earning. Read on and it will become clear why. You must start with applying for Chase credit cards for a simple reason: you can only get 4 personal cards in 24 months before they begin to deny you for some of their cards for no apparent reason. And it doesn’t matter whether you apply for Chase cards or cards from other issuers, which means, get 4 major Chase cards first. Take as much time as you need to do so, even a year if you must. Don’t rush and respect your comfort level. Now I can see some veteran travel-hackers begin to cringe when they read this. Come on, they would say, Chase doesn’t count most business cards. You can apply for a bunch of business cards from different issuers and they won’t show up on your credit report. Even Chase credit cards won’t appear on your credit reports, so you can apply for as many as you want before Chase starts the clock. It’s all true. You can. But it doesn’t mean you should. Do you walk into the water or dive right in? I walk first. Plus remember that there is always a spending requirements. This stuff can easily get overwhelming so pace yourself. Here is how I would do that if I did it for the first time. Spending requirement: 4,000/3mths for 50,000 points and $16,000 more within the first 12 months for an additional 30,000 points. Annual fee $95, waived for the 1st year. Transfer points to several airline and hotel programs including United. Please ignore the second 80,000-points option, as spending $16,000 isn’t worth it for the extra 30,000 points. 50,000 plus 5,000 miles for adding an authorized user. Annual fee: $95, waived for the first year. Annual fee: $95, not waived. Transfer points to several airline and hotel programs including United if you have a premium UR card. Earn 1.5x on every purchase. If you meet the spending requirement and get the bonuses above, you will end up with at least 251,500 United miles (counting the spend). Make sure you can meet the spending requirements or it will be a very expensive mistake! See why I told you about respecting your comfort level? Your only out-of-pocket expense will be $95 for the Chase Business Preferred card, which is not waived for the first year. Note: There are rumors that Chase is going to stop the ability to transfer points from non-premium cards, like Chase Ink Unlimited. If that happens, apply for the Chase United MileagePlus Explorer Business Card instead. Is this the only combination of cards you can apply for? Of course not! If you want to focus on Southwest, you should do it differently. Check my other post on the same topic and my list of the Best Credit Cards for Free Flights. I would start with United, though, because it just gives you more options, especially international destinations. Didn’t know you could apply for a business credit card if you didn’t have an “official” business? Now you do. Everyone has a side hustle nowadays, so don’t be shy. At this point, you are done with the most best Chase cards for at least 2 years. But that doesn’t mean you are done with Chase. You can apply for the following Chase cards even if you’re over 4/24. No one knows what kinds of bonuses will be available in a year or so. Historically speaking, I would expect Citi and Barclays to still offer around 200,000 American Airlines miles between the 2 personal and 2 business cards (they currently have elevated bonuses that come up to 235,000 miles). Then, there is the Citi ThankYou Premier Card 50,000 Points offer right now. The ThankYou program is a great one that also allows transferring points to many airlines programs. Again, no one knows what this offer will be in a few months, let alone a year, but from experience, it should become available again at one point or another. Citi has a restriction of its own – you can’t get a bonus for the card from the same family of cards for 24 months. So if you had one American Airline personal card, you can’t get a bonus for a different American Airlines personal card. Well, what are you gonna do, as they say. Barclays offers quite a few interesting cards, actually including 2 JetBlue, 2 Hawaiian Airlines, and Lufthansa, among others. All of them come with good-to-excellent bonuses every now and then. American Express has a lot of interesting products. First, there are several Delta Airlines credit cards that come with large bonuses from time to time. Then, there are Gold and Platinum Membership Rewards cards. You can transfer Membership Rewards points to a number of airlines and hotels including Delta Airlines. When you’re just starting out, flights come first, because lodging options are usually more plentiful. Having said that, there are lots of hotel credit cards that offer great bonuses. American Express has 4 Hilton cards in its portfolio. Three of them are low- or no-annual-fee cards that currently offer 300,000 points combined. American Express has a once-per-lifetime policy, which means that you can only get 1 bonus for the same product. However, there are so many good American Express cards that you will more than likely find yourself enough to play with. There are other banks with solid credit card offers, too. But what’s here is more than enough to get you started. 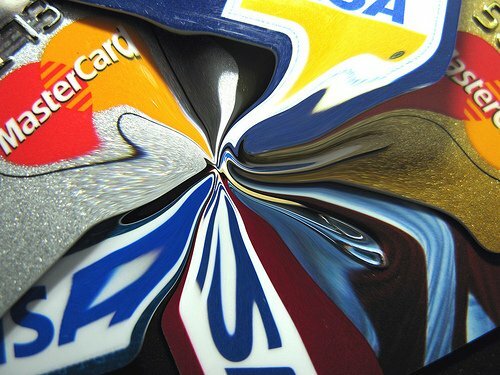 Next: So you’re not a credit card newbie anymore – are you screwed?